Meet Your Neighbor Bobi (Huston) James and family, daughter of Rex and Teresa Huston. She is the oldest of seven children and was blessed with many hours of babysitting AJ, Ty, Clay, Boni, Tucker and Trace to prepare her for motherhood. Bobi is a 2001 graduate of La Harpe High School and a 2003 graduate of Lincoln Christian College with an Associates Degree in office management. 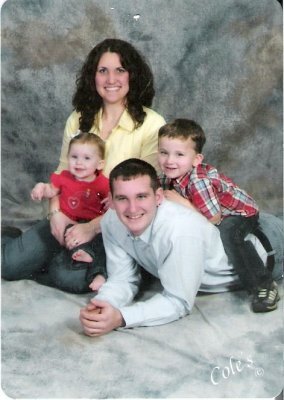 She married Grant James in 2003 and they have two children, Ethan (3) and Rachel (18 months). She is employed at the law office of Richard Rasmussen as his office assistant and has been there for three years. She is also attending WIU taking the Board of Trustees classes. She likes to spend her free time with her husband and children and when she can find the time she likes to "get lost in a good book." She would love to travel to Cancun or somewhere with a beach with Grant to celebrate their 10th anniversary which will be coming up in six years.